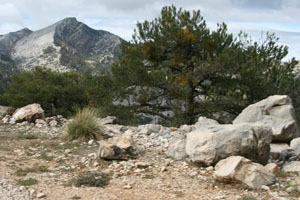 This last trip to Spain I was struck by how much natural beauty there is, all over the world. Sometime I think we're so special here in the USA and the 'New World' - to have the most beautiful land, our mountains and deserts and canyons and rivers, etc etc. But some of the mountain passes we saw in southern Spain were as beautiful, or more so, than anything I've seen here in the USA - comparable to Yosemite. Yes, we are lucky to have areas of such natural beauty (maybe luckiest) but it's because of our huge national park system and and public lands, and because we are just barely coming out of the pioneer stage that it seems unique. There's still so much unsettled land out there, we don't have centuries of civilization leaving grasslands where there were once trees, and forests planted in rows where there was once natural forest, leaving marks everywhere (which is beautiful in a different way). Our 'old' history is the native american, the aztecs and incas, and they didn't leave much of a mark! just a few crumbling remnants (e.g. Machu Picdhu :) and pueblos ... and scattered piles of obsidian flints, and drawings on cave walls, and doodles on boulders. There's a stretch of trail along the Snake River which I love. The Snake River is a major river in the northwest USA, fed into by various mountain sources, and eventually emptying into the Columbia River, and into the Pacific Ocean. The Snake's origin is in Wyoming in the Yellowstone Park region, flowing into and out of Jackson lake. It gathers in volume as it flows westward across the southern Idaho plains. This river has carved immense canyons in it's downhill journey, primarily due to episodic flooding of glacial formed lakes (Lake Bonneville, Lake Idaho) during the ice ages. 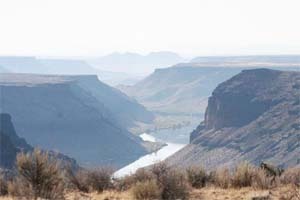 For as long as 11,000 years ago Native American people lived along the Snake River. There is a very special section of the river which is littered with huge rounded boulders, sometimes called 'Murphy Melons' by the locals. These boulders, often as big as houses, were formed as huge chunks of basalt broke away from the walls of the river canyon as it was growing deeper and experiencing massive flooding episodes. These chunks of basalt were rolled down the river, farther with each flood, becoming rounder as the edges were broken off, and finally coming to rest along the river bank as the ice age retreated. 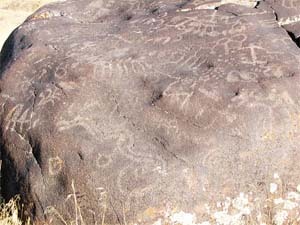 The boulders formed a patina - from the tumbling and the weathering, and were the perfect palette for the drawings of the people that lived along the river so long ago. I've taken several rides along this trail - 'The Petroglyphs' - having been shown the area by locals soon after we moved here. It is very special, and still available to anybody that can walk, bike or ride down to it. Years ago Carol and I hiked another section of the Snake River Canyon - downstream from the Petroglyphs trail, and upstream from Guffy Bridge - an old railroad bridge that was built across the river to transport gold and silver ore from the mines at Silver City to Boise, where it would be processed and sold. 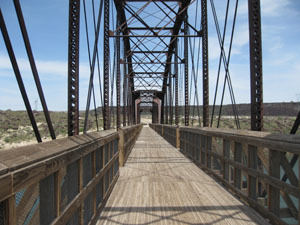 The old rail bridge was converted to a public 'foot' bridge by the Idaho Historical Society, and now connects Celebration Park on the north side of the river, to Owyhee County on the south - with a quietly used and maintained trail system. We were scouting for 'really big loop' ride possibilities - what if we could ride up one side of the river, and down the other? 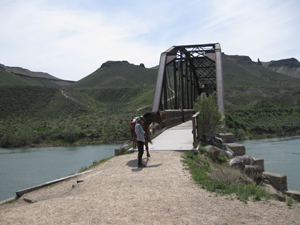 The options were to cross at Swan Falls dam (too narrow and scary, that wouldn't work) or at Guffy Bridge - a great crossing. But, there were these unpassable boulders, those huge chunks of basalt that tumbled down from the canyon walls. 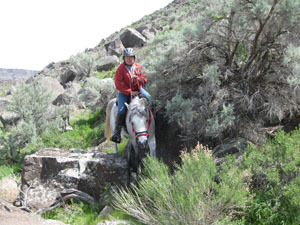 As we hiked the connection between Guffy Bridge and the Petroglyphs trail we thought - nope, not for horses. (unless our friend Charlie wants to come over with some dynamite). 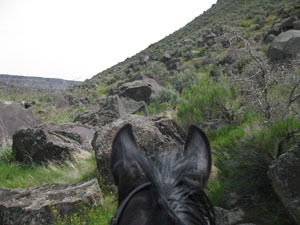 So, not wanting to subject my riders to a trail that would cause undo fear or harm, we set out to test it ourselves. Merri/Jose and Carol/Sooz and me/Batman (new superhero horse) - hauled over to the river and rode up that unride-able trail, and then back down that unride-able trail, and sure enough - it can be done. Let the horse pick it's way through the boulders, they make it seem so easy, stay out of their way and just stay balance. no problem! So now we CAN ride down one side of the river, and back up the other. Of course there's still the issue of being a long long way from base camp - and until I come up with a point-to-point ride we're still bound by home range distance - so it will be an 'up the river, and over the bridge to the other side' ride. It's a start! 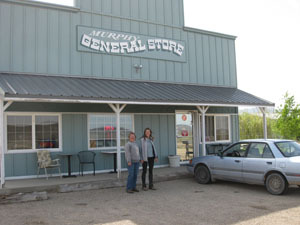 And of course after our long and dangerous ride we had to stop in Murphy on the way home, for a famous Murphy Burger. Another mission accomplished! p.s. Fernando, are you reading this? 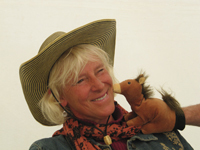 if so, Hola to you and Paco and the whole Maximoto team from Steph and Maxi!